This page contains an overview of a new market study from Flow Research on the worldwide gas flowmeter market. If you are interested in the study, please contact Jesse Yoder at Flow Research by email at jesse@flowresearch.com, or call Flow Research at 781-245-3200. Flow Research has completed a new market study on the worldwide gas flow measurement market. The primary goal of this study was to determine the size of the gas flow measurement market in 2010. Forecasts through 2015 are included. The study is called The World Market for Gas Flow Measurement, 2nd Edition. Flow Research published the first edition of our worldwide gas flow measurement study in September 2004. We have been following the gas flow market regularly since then, providing periodic updates in our Market Barometer and Energy Monitor publications (www.worldflow.com). We have also done user interviews that show that the interest in gas flow measurement among users remains at a very high level. We found that this was an optimal time to quantify the growth in this market, and we took another in-depth look at an expanding market. Gas flow measurement applications and their associated revenues have grown significantly during the last few years. A major driver of this growth worldwide has been the expansion in demand for natural gas and related energy products. There has also been significant new capital projects growth in large regional economies such as India and China during this time as well. Our research determines where growth is occurring - and where it is not - in terms of application, industry, and geography. The results of this study will inform the reader about where the highest returns should be expected to occur through 2014 in these three basic market segments. Featuring Five Add-On Modules ! Our new gas flowmeter study also features five add-on modules that provide more in-depth information on end-user markets and on custody transfer. Module A: An Analysis of the Regional Gas Flowmeter and Natural Gas Markets - Module A is mainly oriented towards companies that want to enhance their instrumentation sales worldwide to the larger producers of natural gas. It includes company profiles of the large producers, relationships among them, strategies for marketing to them, and a discussion of trends in flow measurement relative to these large companies. Module A includes detailed data on major producers and distributors, as well as consumption patterns, in Australia, China, Europe, Southeast Asia, India, the Middle East, North America and Latin America. 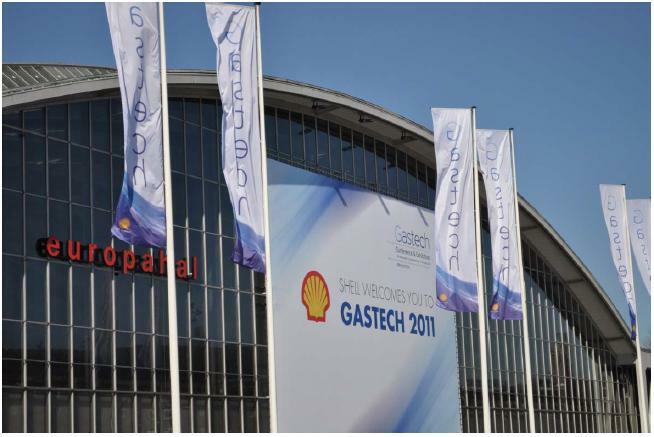 For further information on Module A, visit www.WorldNatGas.com, a WorldFlow website. Module B: An Analysis of the Gas Flowmeter and Natural Gas Markets in Mideast/Africa - Module B included profiles of natural gas producers in the Middle East, and is oriented towards instrumentation companies that want to increase their sales to the Middle East. This module is based on extensive research done on oil and gas companies in the Middle East. In the second half of 2009, Flow Research did onsite interviews with 15 natural gas producers in the Middle East. Companies interviewed were in the United Arab Emirates (UAE), Saudi Arabia, Qatar, and Oman. The purpose of these interviews was to better understand gas flow measurement trends in this region. We asked companies what kinds of flowmeters they are using and what their expectations are for the future. The result provides a very clear picture of flowmeter usage in the Middle East. For further information on Module B, visit www.MidEastNatGas,com, a WorldFlow website. Module C: The World Market for Custody Transfer of Natural Gas - Module C focuses specifically on the market for custody transfer of natural gas, which is the fastest-growing niche within the flowmeter market. Much of the growth in this market has been due to growth in the use of ultrasonic flowmeters for custody transfer applications, spurred by the standards set by the American Gas Association (AGA), the International Organization for Standardization (ISO) and International Organization of Legal Metrology (OIML). Module C covers market data on ultrasonic, turbine, and differential pressure (DP) flowmeters used for custody transfer applications, comparisons among the specific technologies, growth projections through 2015, and strategies for selling into this market. Module D: Strategies, Industries and Applications - Module D provides strategies for companies already in the flowmeter market as well as for those considering joining. Company strategies apply to the entire flowmeter market, as well as to individual product lines. A world view of the market forecasts the best areas for future growth. Module E: Multiphase Flowmeters - This module focuses specifically on the newest type of flowmeter to enter the market. Most applications measure one type of flow, either liquid, gas, or steam. This is called single phase flow measurement. However, a need has now developed to measure fluids with more than one phase. This measurement is of multiphase flow, and it primarily occurs in the oil & gas industry. Flow Research has studied this new technology extensively, and provides invaluable data on this niche market. While there are still a limited number of suppliers, profiled in this module, this is an area that bears watching, especially considering the high price of oil and the continually expanding search for sources of energy. To order this study, contact Flow Research, or fill out the order form above!